Spend a special time with dishes using local ingredients while seeing beautiful sea, mountains and nature. Wooden interior design makes you feel relaxed and nostalgic. Enjoy a luxurious trip that you cannot enjoy anywhere but Tango KURO-MATSU. Eiji Mitooka, the Japanese industrial designer, designed the KURO-MATSU Train. This sightseeing train is based on the theme of "Pine tree", the symbol of Amanohashidate. Eiji Mitooka born 1947 in Okayama Prefecture is a Japanese industrial designer. JR Kyushu's station and train he designed appeared in the public eye. He won the Brunel Award of United Kingdoms, and many of Japanese awards. Wooden interior design makes you feel relaxed and nostalgic. Tango KURO-MATSU Train was designed by Eiji Mitooka, the industrial designer. Jet-black colored body with gold lines looks high-class. The luxurious train is decorated with many of "Pine tree" logo too. 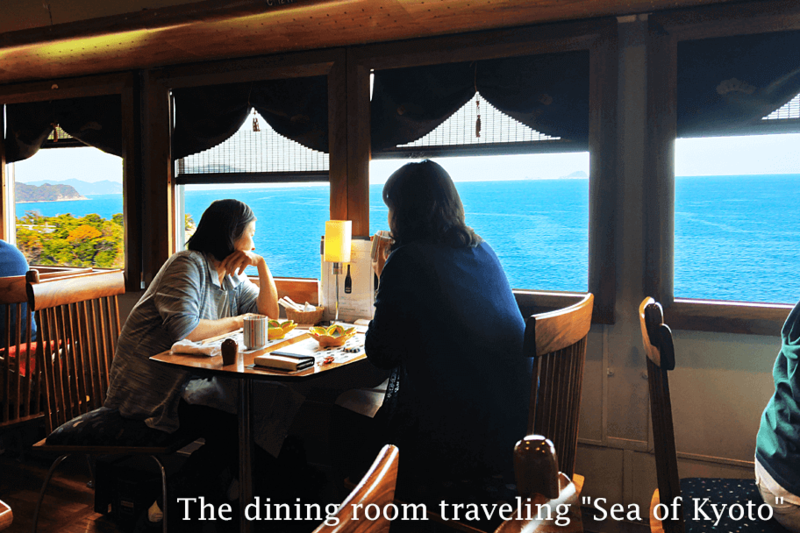 Spend a special time with dishes using local ingredients while seeing beautiful sea, mountains and nature. Attendants are happy to take your photo with your camera or mobile phone. Please feel free to ask us. Put a memorial stamp on the backside of KURO-MATSU memorial boarding card. The card will be given to all the passengers. Various Tango Railway original goods are offered as a souvenir and memory of your trip in Tango area. Some items are limited offer in the KURO-MATSU Train.